Have you been searching for a Toshiba e-Studio 756 multifunction copier? Perfect, then you are in the right place! 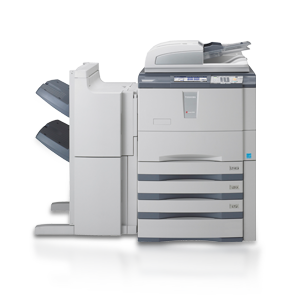 Arizona Copiers has the best copier selection of Toshiba models across the entire state. Whether you are interested in buying, renting, or renting the copier, we will be able to offer you the most competitive prices to satisfy your business’ needs and budget. At Arizona Copiers, we value the loyalty of our great customers and place a high priority on supplying exceptional customer service. You can rest assured that your purchase will have all of the features you require, protected by the best warranty available. Please feel free to contact us with any questions at 602-428-5885 today. A member of the large workgroup copiers offered by one of the leading manufacturers in the industry, the Toshiba e-Studio 756 is a business’ paradise. It is a copier, printer, scanner, and fax machine all rolled into one convenient unit that will not take up too much precious office space. This Toshiba model offers a lightning-fast printing and copying speed of 75 pages per minute, which means all of your documents will be ready within seconds! The extremely quick printing speed still pays close attention to detail, with its high-quality 2400×600 dpi resolution. Knock out your business’ competition with the clarity, sharpness, and appeal of all of your business’ projects. When you purchase with the Arizona Copier company, your business will benefit from a very large capacity copier. It is capable of producing 540,000 pages a month, which is 440 percent more than other copiers on the market. Plus, this Toshiba model includes a paper cassette tray that can hold up to 7,600 sheets, which is far more than you will find with any other copier. Whenever the paper runs out, the copier is extremely simple to use and refill the paper trays with ease. There will be no need to call for your IT department, since even those that are not techies can handle this effortless replacement. The Toshiba e-Studio 756 also supports a number of different interfaces for seamless document sharing throughout your network on Wi-Fi, Ethernet, or USB drives. The copier is also compatible with all major operating systems, including all provided by Microsoft and Mac. The built-in high- speed fax machine allows two separate lines to never miss a beat at delivering your business’ documents in a flash. Why the Toshiba e-Studio 756 is the Right Choice! Toshiba is renowned for creating cutting-edge technology that can accomplish a variety of multifunctional tasks. All of the Toshiba models are an ideal choice for busy offices and growing businesses. The Toshiba e-Studio 756 is no exception to this rule, especially because of its high-speed output and energy efficiency features. Arizona Copier will help you obtain this outstanding copier at a cost-effective price with backing by an industry-leading warranty. Please contact us immediately at 602-428-5885 to learn more and get started on your next best purchase!